France is a nation of food lovers and the food culture contains some interesting facts. Food is to be enjoyed and savored, for example, lunch time in France is usually two hours long just for this reason. Except for large cities, almost everything closes from noon until two pm when French restaurants are open for lunch. Researchers are still trying to explain the ‘French paradox’ - low rate of chronic heart disease despite high saturated fat diet; some explanations include their consumption of red wine, the French style of eating and/or the saturated fats being mostly from dairy. The French also have one of the longest life expectancies of any EU country (longest for females, 3rd longest for males) and the incidence of obesity is very low (lowest in EU for men and 2nd lowest for females). In 1652, the first French cookbook appeared. "Le Cuisine François," was written by a famous French chef, La Varenne, and it showed how French cuisine had become a vital part of cooking and dining in Europe. The book provided many preparation methods, including making a roux (a mix of flour and butter used for thickening soups and sauces). Before roux, the French, and others, had simply put bread in the soup to thicken it. Changes like these would make French cooking the most important type of cooking in Europe, and then the world. After more than two years of lobbying by President Nicolas Sarkozy and a brigade of French chefs, academics and politicians, French cuisine in 2010 earned a spot on UNESCO's World Heritage List. The "gastronomic meal of the French" — defined as "a festive meal bringing people together for an occasion to enjoy the art of good eating and drinking" — took its place alongside other embodiments of cultural heritage on UNESCO's list celebrating world art forms and traditions. France is a republic; the head of the executive is thePresident, elected by universal suffrage, currently Nicolas Sarkozy. The President determines policy with the aid of his Council of Ministers (Conseil des ministres). Ministers cannot sit in parliament, and if an elected member of parliament (député) is appointed minister, he or she has to hand over parliamentary duties to his / her deputy (adjoint). Since each elected member has a deputy, by-elections are unusual in France. The lower and principal house of parliament is theAssemblée nationale, or national assembly; the second chamber is the Sénat or Senate. Députés (members of parliament) are elected to the National Assembly by universal suffrage, in general elections (élections législatives) that take place every five years. Senators are chosen by an electoral college of "grand electors", who are mostly other local representatives. The electoral system for presidential and parliamentary elections involves two rounds; a candidate can be elected on the first round by obtaining an absolute majority of votes cast. The second round is a runoff between the leading two candidates from round one (presidential election), or two or more candidates (parliamentary elections). Metropolitan France is administered as 22 regions, 96 "départements" or departments, and some 36,000 "communes". See maps of regions and departments. Each region is administered by a Regional council (Conseil régional), and each department is administered by a county council (Conseil Général). The central government is represented in each department and region by a Prefect (préfet), with powers over the police and public security. The Prefect's other main role is to make sure that local authorities administer their area in compliance with national law. Prefects are appointed by the President, regional councils are elected by universal suffrage every six years, involving a complex two-round semi-proportional voting system. Departmental councils, conseils généraux, are elected by universal suffrage every six years, in elections known as canton elections (élections cantonales). Communes are run by municipal councils (conseils municipaux) elected every six years by universal suffrage. Increasingly, the important business of small communes, and issues that involve communes and their neighbours are dealt with by groupings of communes, known as "Communauté de communes"
The Geography of metropolitan France (France in Europe): key data. Surface area: 547,030 sq km, of which 545,630 sq km of land and 1,400 sq km of rivers and lakes. 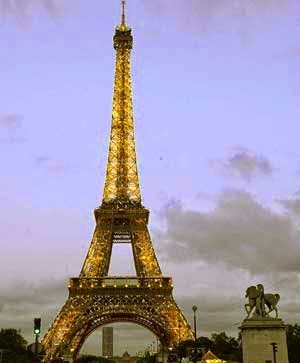 Paris, the capital city of the country France is celebrated most for the Eiffel Tower, Napoleon's tomb and Notre Dame. This city is also known as the world's fashion capital. The very popular Statue of Liberty was created in France, and gifted to the United States of America. The face of the statue is sculpted similar to the face of Isabella Eugenie Boyer, wife of the manufacturer of the Parisian sewing machine, Isaac Singer. The official language in France, French was also the official language of England for more than 300 years. The 1st of April originated as the fools day from France. When the country switched over to the Gregorian calendar people unaware of the change considered 1st April as the New Year's Day. From that day onwards the fool's day originated to mock them.